Boxing legend Muhammad Ali has passed away after a more than 30-year battle with Parkinson's disease. He was 74. The former world heavyweight boxing champion had been admitted to a hospital in Phoenix, Arizona, and was fighting respiratory issues that were complicated by the Parkinson's disease. Doctors say the Parkinson's likely was caused by the thousands of punches Ali took during his career as a boxer. Ali, both beloved and controversial, so dominated professional boxing that Sports Illustrated magazine named him Sportsman of the 20th Century. Known for his boasting, passion and way with words, he famously said he could “float like a butterfly, sting like a bee." FILE - Heavyweight champion Muhammad Ali stands over fallen challenger Sonny Liston, shouting and gesturing shortly after dropping Liston with a short hard right to the jaw, in Lewiston, Maine, May 25, 1965. The son of a Kentucky painter took up boxing after neighborhood bullies stole his bicycle. His trainer said the boy, then known as Cassius Clay, grew to mix raw talent with determination. In 1964, Clay shocked overwhelming favorite Sonny Liston to win his first world heavyweight title. Washington Post newspaper sports columnist Mike Wise said the confident boxing great continued to dominate, fighting with both his fists and his words. "He was probably the first guy, the first athlete in America, to brag about something and back it up. Nobody boasted in those days," Wise said. After that fight, Clay, who had joined the nation of Islam, changed his name to one that is revered around the world -- Muhammad Ali. Three years later, he was vilified for refusing the U.S. Army draft based on his religious beliefs and his opposition to the Vietnam War. Ali was convicted of draft evasion and stripped of his title, keeping him out of the ring for three years until the Supreme Court overturned his conviction in 1970. 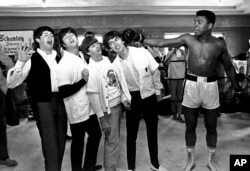 FILE - The Beatles, from left, Paul McCartney, John Lennon, Ringo Starr and George Harrison take a fake blow from Cassius Clay, who later changed his name to Muhammad Ali, while visiting the heavyweight contender in Miami Beach, Fla., Feb. 18, 1964. Just months after returning to the ring, new heavyweight champ Smokin' Joe Frazier dealt Ali his first professional loss. But Ali later took his revenge against Frazier and won their second fight. Another classic bout for Ali was against George Foreman. Ali and Foreman took their 1974 championship fight to the former Zaire, in a remote part of central Africa. It was a boxing match immortalized as the "Rumble in the Jungle." "I have wrestled with an alligator. I have tussled with a whale, handcuffed lightning, thrown thunder in jail. Bad, ain't I?" Ali said. "Only last week I murdered a rock, injured a stone, hospitalized a brick. I'm so mean I make medicine sick. Bad, fast!" The Post's Wise said, "... And for him to employ what people still think today was one of the most amazing strategies -- act like you're tired, let the big guy punch himself out -- and then all of a sudden galvanize yourself and find a way to knock him out in the eighth round. That was still probably the most triumphant moment in boxing history." 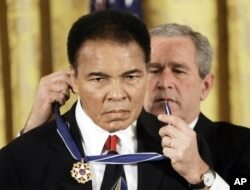 FILE - President George W. Bush presents the Presidential Medal of Freedom to boxer Muhammad Ali in the East Room of the White House, Nov. 9, 2005. Ali then met Frazier in their third and final clash. It was late 1975 in the Philippines, dubbed "The Thrilla in Manila." 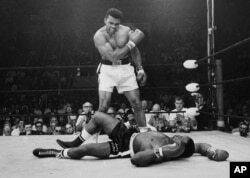 Ali endured 14 brutal rounds before emerging victorious. The athlete retired from boxing in 1981 with a 56-5 record, including 37 knockouts. Ali's last public appearance was in April at the "Celebrity Fight Night" dinner in Phoenix, which raises funds for the treatment of Parkinson's. The boxer has kept a low profile recently, and has not spoken in public for years. Ali, who lived in Phoenix until his death late Friday, had been hospitalized several times in recent years, most recently in early 2015 after suffering from a severe urinary tract infection. 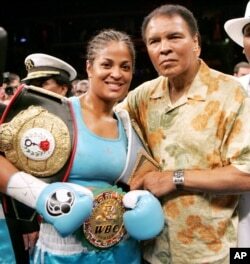 FILE - Laila Ali, left, poses with her father, boxing great Muhammad Ali, after her win against Erin Toughill at the MCI Center in Washington, June 11, 2005. The athlete lit the Olympic torch in Atlanta in 1996, despite trembling from Parkinson's disease. In 2005, he received the Presidential Medal of Freedom, the highest U.S. civilian honor. News of Ali's hospitalization brought concern from friends and admirers, including fellow boxer Sugar Ray Leonard. "Prayers & blessings to my idol, my friend, & without question, the Greatest of All Time!" Leonard tweeted. A funeral will be held in Ali's hometown of Louisville, Kentucky. Ali, married four times, had nine children. "Muhammad Ali was beloved. There was a heart component that I don't think anybody will ever touch," Wise said.